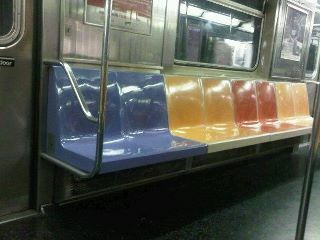 stop genetic experiments on subway cars! just saw this ungodly abominations the other day. genetic testing on subway cars. old D-R subway cars interbred with A-C cars by the unethical hands of a mad MTA scientist. DR chromosomes mixed up with AC results in this freak of rails. subway genomes, kawasaki car DNA helixes, where will the buck stop? we need a new geneva convention on human experiments custom designed for subway cars. this needs to stop. call up your rabid preachers, vicious republican representatives, religious groups, etc and petition the president to stop genetic experiments on subway cars. your protests and self-righteous evangelical dogma worked for stopping stem-cell research, which would have had scientists play god and mess with _____’s (insert the name of the deity of your choice: yahweh, allah, zeus, keith richards, whatever) intelligent design only for the paltry ends of curing cancer, epilepsy, spinal injuries, blah blah– it should also work for genetic tests on subway. go, pen up and write your petitions!